So many news media and Hollywood types are out with comments like "If you support Trump, you support RACISM! It had me wondering, if you don't STAND AGAINST the moral stains created by disenrolling tribes, does that mean YOU SUPPORT ABUSES of Civil and Human RIGHTS?! For over a DECADE, we've written to our State's Senators (Barbara Boxer , Feinstein and most recently Harris ), local Representatives and at least THREE U.S. Attorney Generals (Holder, Lynch, and most recently Jeff Sessions) Crickets chirping is the usual response. And the entertainers, yes we wrote to many, asking them not to perform at an APARTHEID reservation, including George Lopez and Gabriel Iglesias, who we sent more than 50 faxes. Not a response. Does this mean they approve of civil rights abuses? Here's what we've seen on the Charlottesville/Trump response and the lumping everyone together. Don Lemon, CNN anchor, excoriated both President Donald Trump as well as his supporters on Wednesday morning, and claimed that those who support the president are “complicit” in racism. Howard Dean lumped white supremacists and the GOP together when he warned voters not to vote for racists. "If you want to vote for a racist in the White House, then you better vote for Republicans," the former governor of Vermont said on MSNBC on Saturday. Michael Moore appeared on CNN for an explosive interview in which he equated support for Donald Trump with racism. 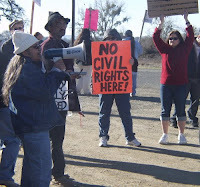 With the vitriol and logical fallacies above, why can't we say, If you don't stand against civil rights abusing tribes, YOU are ANTI-civil Rights for Native Americans? That's not true, right? It simply means you haven't gotten involved. Remember when Prof. David Wilkins wrote a letter to Native American Interest groups who were missing in action on civil rights and who bury their heads in the sand? Those who bury their heads in the sand are no different than those who stood by and watched the civil rights of millions be held back for generations. Don't let that be continue to be YOU. It's not too late to add your voice against the abuses of tribal disenrollment. 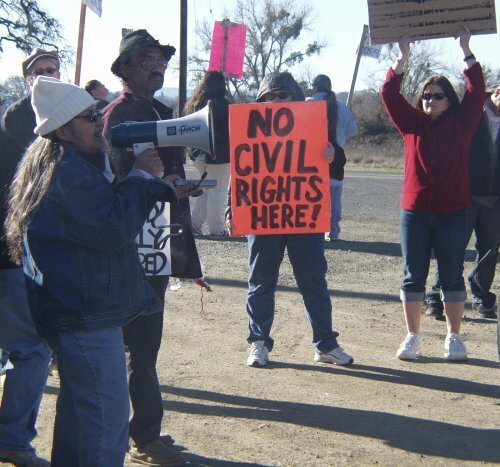 DAILY KOS: DISENROLLMENT 101 Share this story!